The HRG Innovation Committee is now operational and working on the ideas submitted by fellow HRG-ers. I was thrilled and amazed at the number of good ideas that came to us via the innovation posters, innovation lab whiteboards, and emails. The ideas cover small operational improvements to larger ideas about technology and workflow. These contributions speak volumes about the ownership culture we have. A critical component to innovation, and a company’s long term success, is what Guy Kawasaki calls “jumping-the-curve” innovation. Guy is an innovation guru and author of many books on innovation and branding. Jumping the curve entails knowing the industry trends, looking into the future, and coming up with ground breaking new products or services that set new standards and bring about a new level of industry norms. Guy Kawasaki uses the example of the daisy wheel printer. Instead of looking at the current printer and improving pieces of that printer, Hewlett Packard (HP) turned the printer industry upside down with the introduction of the laser printer. That is when HP really made their name and achieved a surge in growth and share value. Other companies that didn’t keep up with the new laser printer technology lost significant market share, and several went out of business. Businesses have a life cycle. They reach a point where sustaining growth selling the same old product or service, or following the same tried and true process, is nearly impossible. In order to survive, companies must jump the curve to get ahead of the competition and the industry. To sustain decades of successful performance, a company needs to jump the curve time and time again. 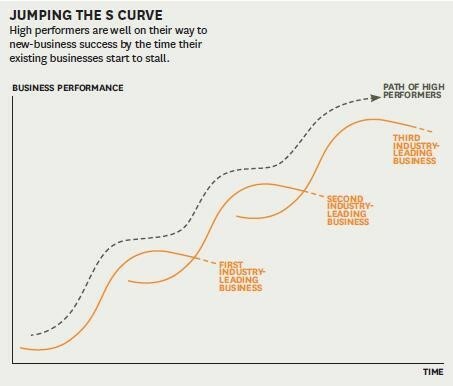 The chart below illustrates the life cycle of a high-performing company and how jumping the curve is essential to long term success. The healthcare revenue cycle services industry and HRG are primed for the next curve jump, the next big outside the box idea. Wouldn’t it be fantastic and financially rewarding for HRG’s ESOP owners, if the next industry-disruptive development for revenue cycle services originated, and was perfected, right here at HRG. You as the employee-owner are in the best space to create that next big thing. Stay mindful in your job. When working (or anything else in life) don’t just go through the motions, but be aware and always look at how you/we can do this better. Stay abreast of the changes in the healthcare industry. Get your hands on all you can read about what’s going on in the business of healthcare. Knowing where the industry is headed is the first step in setting a new course and jumping the curve. Don’t let “that’s never been done before” or “that’s not how we do things” block your creative vision. Start with the most audacious ideas and then figure out how to make them work within our reality. Don’t be afraid of a bad idea. Many current innovative products started with an idea that seemed impossible or impractical. Yet, through the innovation process they became leading edge. Look at Uber, Amazon, Apple, and many others that are now disrupting long term norms and leading us all down new paths. Don’t doubt yourself or HRG. You are intelligent, have great ideas and you work for a world class company. This combination gives us all opportunity for creative innovation and great success. Make sure your ideas are shared. The biggest shame is a great idea that never sees the light because it was never shared. What is it that our clients really want? What is it that their patients really want? What does our industry lack in providing the above? As we look to the future our goal remains to become the industry leader in revenue cycle services and provide our owner/shareholders a rewarding financial outlook. In order to meet these goals we need everyone to be innovative. I look forward to seeing and implementing many more innovative ideas from our ownership team and new adventures on the road to jumping the curve. PRESIDENT AND CHIEF OPERATING OFFICER FOR HEALTHCARE RESOURCE GROUP INC.
Greg has over 24 years of healthcare management experience working closely with clinics, hospitals, vendors, and insurance carriers. 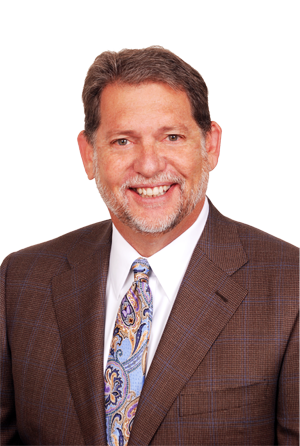 Greg's expertise in revenue cycle process improvement, payer contracting, patient collections, and team building has made him one of today's voices of the healthcare industry.